We all have a superhero inside us, it just takes a bit of magic to bring it out. In Billy Batson’s (Asher Angel) case, by shouting out one word - Shazam! - this streetwise 14 year old foster kid can turn into the adult superhero, Shazam (Zachary Levi), courtesy of an ancient wizard. 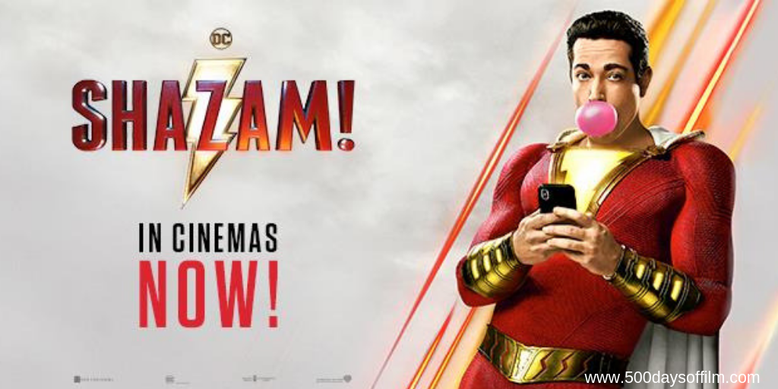 Still a kid at heart, Shazam revels in this adult version of himself by doing what any teen would do with superpowers: have fun with them! Can he fly? Does he have X-ray vision? Can he shoot lightning out of his hands? Can he skip his social studies test? Shazam sets out to test the limits of his abilities with the joyful recklessness of a child. However, he’ll need to master these powers quickly in order to fight the deadly forces of evil controlled by Dr Thaddeus Sivana (Mark Strong). Shazam! is a blast. A consistently funny, silly and extremely likeable popcorn family movie. A mash-up between Deadpool (without the swearing and crude humour) and Big (without the rather icky “romantic” scenes). Much of the film’s success lies with Zachary Levi’s charismatic performance. He has a wonderful sense of comic timing and is a joy to watch. Asher Angel is also impressive, carrying the weight of the film’s more emotional scenes. Meanwhile, following his enjoyable turn in IT, Jack Dylan Grazer portrays Shazam sidekick, Freddy, to endearing and often scene stealing perfection. Of course, no superhero is complete without a baddie. Mark Strong has moustache-twirling fun in his role as Dr Thaddeus Sivana. Yes, he is only there to drive Billy’s story forward. Yes, he is pretty much like every evil dude out there... but, nonetheless, his presence is always welcome. While Shazam! offers us much to laugh at (it is just a shame that many of the best jokes are in the trailer) the movie also features a couple of surprising and enjoyable horror sequences. This is, after all, a film from David F. Sandberg, the director of Annabelle: Creation and Lights Out. There’s nothing here that would particularly disturb a 12 year old (the BBFC has given Shazam! a 12 rating for moderate violence, threat, horror, innuendo and bleeped strong language) but it is worth considering if you are planning to take younger children. I had a lot of fun watching Shazam! at the cinema. It certainly worked for my audience and I can’t wait to see it again. Much like Marvel’s Ant Man, this film is a breath of charming fresh air amid a host of dark, world-ending comic book movies.